On March 14th, 2015, Elvin E. Helms Lodge No. 926 will host its Fourth Annual David Wood Memorial Chili Cook-off. Festivities will begin at 10am and the winners will be announced at 4pm. This event will be held at the Petersburg Community Center located at 6517 Market Street, Petersburg, KY 41080. For directions click here. Lodge members, family, and friends can enter and everybody can vote. There will be three classes: classic, exotic, and hot. There will be prizes in each class. Bring any condiments you want to accent your chili. Our Lodge will provide iced tea and water (soda will be available). Judging is simple, just put a $1 donation in the ballot box of your favorite chili. Winners announced at 4pm. Why: Proceeds from the dinner will help to defray the expense of medical costs. Emersyn James Potter was born October 6, 2014 due to complications during pregnancy. He was not due to arrive until January 7, 2015. He weighed 1 pound 9 ounces and was 12.5 inches long. Since birth he has been in the NICU at Kentucky Children’s Hospital. He has had pneumonia twice and has been diagnosed with chronic lung disease. As of December 6th, Emersyn weighs 5 pounds and is over 16 inches long. While he continues to grow and put on weight, his lungs remain underdeveloped, keeping him on a ventilator. It is not known when Emersyn will get to come home. 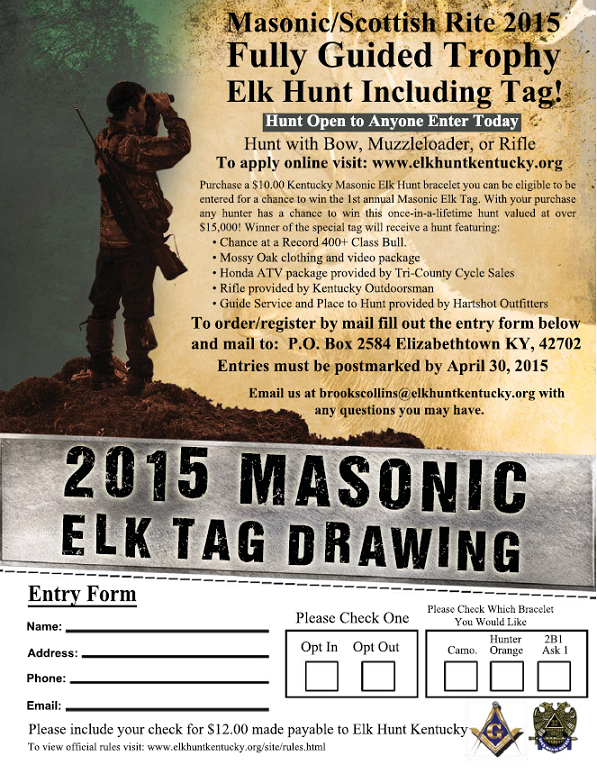 100% of the money raised will go toward scholarships to Kentucky Youth Conservation Camps. 6000 underprivileged kids each year apply for these scholarships and the vast majority of them are denied because the funds just aren’t available. At $200 per child to go to camp, that makes our goal $1.2M. If we can reach this lofty goal every single child in Kentucky that wants to go to conservation camp this summer will get to go. That said, enter early and enter often! Even if you don’t win you still get to know you helped kids learn about and enjoy the great outdoors. Last but not least, thanks to the GENEROUS support of Right Worshipful Grand Senior Warden P. Todd Jones, Brooks Collins, Kendrick Walker, Rickie Tharpe, Mossy Oak, Tri-County Cycle Sales, Kentucky Outdoorsman, and Hartshot Outfitters this is a REAL charitable cause. There is ZERO “administrative overhead” in this fundraiser. 100% of the money raised will go directly to sending underprivileged Kentucky youth to conservation camp this year. Following another successful Christmas Drive for Kelly Elementary we received a thank you card from the school’s Family Resource Officer Shelly. Through the generosity of the members of Elvin E. Helms No. 926 and our visitors throughout the year we were able to provide a happy Christmas morning for 10 local children. Big thanks to Brother Jason Wallace in coordinating this program.